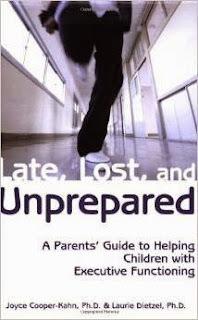 Late, Lost, and Unprepared, by Joyce Cooper-Kahn & Laurie Dietzel, Ph.D. The full title of this book is Late, Lost, and Unprepared: A Parents' Guide to Helping Children with Executive Functioning . This book came recommended to me as a means of offering some help or advice in dealing with some learning difficulties we are experiencing here. I hesitate to label what we have as a "learning disability" because that tends to denote something negative in people's minds and I don't think what we're dealing with is remotely crippling. Challenging sometimes? Yes! Crippling? No. Worth reading a book about to help me help my kids? Absolutely! Your first question might be the same as mine: what is executive functioning? "Executive function refers to a set of mental skills that are coordinated in the brain's frontal lobe. Executive functions work together to help a person achieve goals. integrate past experience with present action"
Our issue has been failing to remember a set of details and instructions, instead seeming only to focus on one-step processes at a time. To give an example, I might have to say, "Go get your socks" and then wait until that task has been accomplished before I can say, "Ok, now put them on." If I were to say, "Go get your socks and shoes and put them on" the person might walk in the general direction of socks and shoes but then might stand there for awhile trying to remember the set of instructions instead of moving ahead with the task at hand (or at foot, as the case may be). Frequently it feels like I have have to think in terms of baby steps when offering instruction and I've not always been sure what the problem is or how to handle it. In reading this book I feel like I've been offered a great introduction to the idea of teaching how to build and grow my children's ability to take in information, process it and complete tasks and assignments for themselves. Now if I can just take and apply this advice, maybe we'll see some improvement! The authors of this book focus a lot on creating short term training solutions to promote long-term success in a child's ability to thrive independently. While it is true that a person who has executive dysfunction can likely make their way around in the world without anyone's help, the authors (and myself) would argue that such children will be better prepared to manage themselves well as adults if their parents help develop their ability to self-discipline when they are young. To develop such self-discipline and focus, they truly do need the help of parents (or guardians or teachers, etc.). Certainly I think that if parents are willing to address a child's strengths and weaknesses and offer instruction from a very early age, the frustration levels in many areas of society are greatly decreased. - Lower expectations to a level that is attainable at the present. - Establish a regular routine for accomplishing any number of tasks so that the child can learn through repetition. - Follow through on what you say you will do to help your child out. - Encourage them and cheer them on when you see even the slightest bit of change for the better. Personally, I felt convicted about not having a steady, more predictable daily schedule for our kids. Yes, we do some of the same things every single day but we really don't have a particular Order of the Day that we follow which leaves them in a perpetual state of wondering, "What Will Happen Next?". I tell myself that I like the variety but I know that my children would "perform" better if I would lay out expectations for them that they could understand and relax into. I think that's a fair assessment and I hereby purpose to create a predictable "program" for our days that they can more easily follow along with. I also liked Cooper-Kahn's and Dietzel's suggestion to set a timer to help keep kids on tasks. We tend to do that only when a child has failed to accomplish a task and needs a ticking motivator to do so. I think a timer would help set expectations up appropriately so that we wouldn't have as many harried and hurried moments in the end. If I were more specific with our schedule for the day and time allotments, I can see them being able to focus on the jobs at hand. Upon reflection, I can see how I tend to leave things open ended, leaving them wondering if they need to hurry to get a job done or take a more, um, leisurely approach. What I'm saying is that, by examining my own life, even though I approach things in a manner that suits me and which I understand, it comes across as a great mystery to the little people. That's not very fair to them as they are trying to be part of a team and do their part. As I say, I'll be getting right on that Schedule for the Day. It's the right thing to do for them. It makes perfect sense to me that if you are repeating a schedule, a young person will more easily catch on to what the plan is and will learn to follow along and do what is asked of them, quite willingly and happily! Predictable structure would be a better thing for our family with the ages they are at, I think. Anyway, I'll be working on that! It is going to take a little time for us to shift in our thinking so that we can navigate life all together more easily. As I sort of mentioned, in our family we talk a lot about being a team. We're all in this together. When one member struggles, we all struggle. Being given a resource that helps to encourage and advice according to the particular issues we've been facing has proved vastly encouraging to me personally. (It has also proved enlightening! I wouldn't have pegged myself as one who is so disorderly in a systematic approach to things themselves.) Taking things slow, rearranging and then ordering life is something I shall prayerfully and practically go about doing. Honestly, I wasn't quite sure whether or not I really wanted to "review" Late, Lost, and Unprepared on the blog, given the more personal nature of what it means to me. But then again, I figured other parents out there might be struggling with some of the same issues. This is a relatively short book (203 pages), is thoughtfully laid out to allow you to read it in short snippets if your reading time is limited. It gives practical, encouraging advice and who doesn't want that?! I'm glad to have read it and would happily recommend it to others if they felt they had a need. Sounds interesting. I can definitely pick out my child who is a whiz at this (she actually created symbols to write on her calendar for when she should do various tasks!) and my child who is NOT. We have a daily routine or order of tasks. Breakfast, chores, school, lunch, quiet time, play time, clean up, supper, bedtime. It really does help everyone know what to expect as we move through our day. Meals and snacks are the only thing tied to a specific time. Very interesting! I had heard of the issue but hadn't heard it called that. Like Stephanie, we've been advised to have a predictable routine every day but not specific times. That way our daughter will know what comes next at all times. Some days it may take us longer to work through the schedule and that's ok. But it should help her to know the order things will happen. First this, then this, then this. It will become habit.